Who Else Wants To Watch Over My Shoulders As I Set Up A Proven Affiliate System That Multiplies My Online Profits Manifold... Step-by-Step! Discover And Bridge The Missing Link That 95 Of The Product Sellers Are Having A Tough Time Figuring Out... Which Is Stopping Many Of Them From Exploding Their Monthly Profits By At Least 10 Times! Up until now, you have heard of Internet Marketing experts echoing the popular advice of starting your own affiliate program. And if youre already selling your own digital product online, why not? You can easily leverage on the efforts of hundreds of affiliates enthusiastically spreading the word about your product around the Internet. It is smarter to leverage on 1 of the efforts of 100 affiliates than 100 on your own, and you pay a cut from your products price to your affiliates only when they make sales, so theres virtually no risk in putting money upfront to lose. This is the exact, same secret that Internet Marketing experts use to increase their monthly business revenue by 10 times as much! Because if its so easy then why arent more product sellers like yourself doing it? The truth that most marketing experts often usually omit in their courses is that theres a price to pay for using this powerful method. And I found that out the hard way when I was in your position. I too was selling my own product online and when I started to have some success, I wanted to take it to the next level and like you, I heard from other business associates that I should have my own affiliate program and find affiliates to promote my product for me. Sweet case scenario... but I had to first overcome my technical inability. The cold, harsh reality is that setting up your own affiliate program isnt by far easy to do. If youre not technically savvy like I was, then you can probably relate to this very well. And even if you are technically savvy, do you know how to recruit affiliates - affiliates that can produce sales for you? Sure, you can try to eliminate most of these problems by signing up with ClickBank and get rid of most of your guesswork. But theres only a 50-50 chance of getting your product approved into the marketplace. What if your product doesnt meet the stringent requirement? And what if youre from a country not acknowledged by ClickBank by any chance? With the help of some luck and good marketing mentors, I finally found not only one, but a few ways to set up my own in house affiliate program. It took me a while to get used to it and now its as easy as a walk in the park for me. And what can I tell you after jumping through hoops? Its not easy unless you know what you want and you know what to do. I also realized how little the experts talk about setting up your own affiliate program in their books and courses. Yet I am very proud of my discovery with easy affiliate setup and I believe that if a non-techie like me can do it, why cant you or anyone else? Finally... its now possible to set up your own affiliate program and recruit your own army of affiliates to promote your product for hot commissions with full enthusiasm and excitement! If you want to learn how to do exactly what I did to explode my monthly income with my own affiliate program... minus all the guesswork and hoops... then I invite you to watch over my shoulder! Watch Over My Shoulder In Affiliate System Explosion...! Video #1: What is an Affiliate System? How Do You Know What Type of System Will Fit Your Needs? Most businesses miss out on increased profits because they choose not to have an affiliate system. Whether its because its too complicated or they dont want to give commissions away, they are losing profits either way. The affiliate system allows you to pay people for making sales for your product and with it, affiliates market your product; they win and you ultimately win. While there are so many affiliate systems out there, the question is how do you know what type of system will fit you? In this video youll learn just that and how to brainstorm ahead of time. Choosing the right affiliate system to fit your needs is very important. Whether you choose to host it on your website and full control over it or give the control over to an affiliate network, the choice is yours. Or if you want take time to pay people yourself, keep your accounting records, etc, or let an affiliate network do it for you; that is up to you. In this video you will be given many options and shown the advantages and disadvantages of them so you can decide for yourself. Clickbank is considered both a payment processor offering many varieties of payment types, but it is also an affiliate network. Since there are so many affiliates on Clickbank looking to promote products, we have chosen this affiliate network to use in this video series. In this video, you will learn how to a Clickbank payment link, which you can add to your sales page. This is important to make your product sales page affiliate ready. When an affiliate comes your site, particularly your affiliate page, you need to have a few pages available to them to convince them to promote your product, which in this case is your landing page. Then you have the affiliate resources page. In order to connect the two, you are going to learn how to do just that using Aweber. Aweber will allow you to build your affiliate list, which youll want to keep separate from your other lists. Video #5: What Resources Should You Provide Your Affiliates? Once your affiliates sign up to start promoting your product, you need to provide them with as much promotional resources as possible. A larger percentage of them will actually just copy and paste the resources exactly as they are, so whether you write email solo ads, email follow up ads, PPC, blogs, etc, make sure they are the best quality. In this video, youll learn learn the importance of these resource types and how to implement them into your affiliate system. Paying your affiliates on a timely basis is important to keeping your relationship with them at the highest level. They work hard, so they need to be paid at the time your promise. Well look at Clickbank versus Hosted Systems. Some systems will pay your affiliates for you, but they take a fee out, so your profits may not be as high. However, your affiliates are paid on a timely basis, which builds up your relationship. If you have a hosted system, its just the opposite and well look at these options. While paying your affiliates yourself can take time, if you use Paypal then youre in luck. Paypal offers a feature called Mass Pay, which allows you to pay all of your affiliates in one full swoop. In addition, Paypal doesnt charge your affiliates the average paypal fees if you use mass pay which in turn makes your affiliates happier. Whether you plan to leverage on ClickBanks unique affiliate platform or take full responsibility of your business with in-house affiliate systems, theres a solution for every method you want. And after watching the videos for less than an hour, you will know how to double, triple or even decuple your monthly and annual profits simply by providing an opportunity for hundreds of other motivated affiliates throughout the web to profit with your line of hot selling products! For ClickBank Merchants: how to systematically set up your product on the most popular affiliate platform and get approved - hundreds of thousands of ClickBank affiliate marketers flock this website every day! How to find and get affiliates to promote your products for you willingly and enthusiastically! I will also show you how to provide them with everything they need so the only thing they have to do is promote for you, and give them no excuse not to promote your product! How to pay an army of affiliates easily using a few clicks of the mouse - this will help reduce your stress and frustration by more than half when that time of the month comes! And if I can help you overcome your technical difficulties in less than 30 minutes that can lead to your income explosion of at least 10 times your current online profits, how much is this information worth to you? This is something that a lot of books and courses out there loosely talk about in theory only and finally, you can watch over my shoulders in my exclusive video tutorials - every step of the way - and set up your own affiliate program! Its as easy as monkey see, monkey do! Im going to be reasonable with pricing this so for only $47.00 you can learn everything you need to know about multiplying your web profits with your own affiliate program setup, and materialize it all in easy-to-follow steps. I am constantly humbled by my past experience as a newbie so Ive done this video in as layman as possible, so you can finally have your affiliate system in place for a one-off work and still enjoy doing business from home, enjoy the benefits of autopilot income and amplified marketing leverage on hundreds of affiliates! You dont have to say a yes now, just a maybe will do. 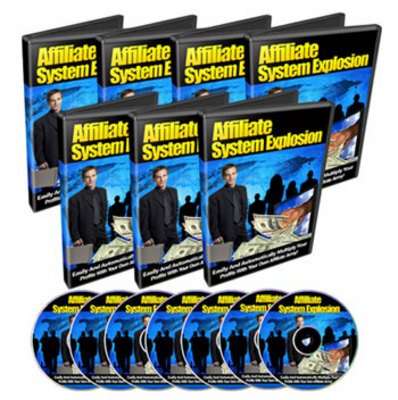 Purchase my Affiliate System Explosion videos now and check it out for a FULL 90 DAYS. Check out my videos after you have made your purchase and follow the steps as I reveal the how to step-by-step to setting up your own affiliate program network and start recruiting your own affiliates to promote your products for you and help explode your monthly sales. If its not what youre looking for or cant get the kind of results you desire, simply ask for your money back. You cannot lose. NOTE: You need to have Adobe Flash Player to view all of the videos. If you dont have the application installed in your computer, you can get the plug-in from the Adobe official website for FREE. Link to the application will also be provided in the customer download area.